Background: We want an APRS backbone serving Appalachian Triail Hikers with APRS radios covering the 2000 miles from Maine to Georgia. 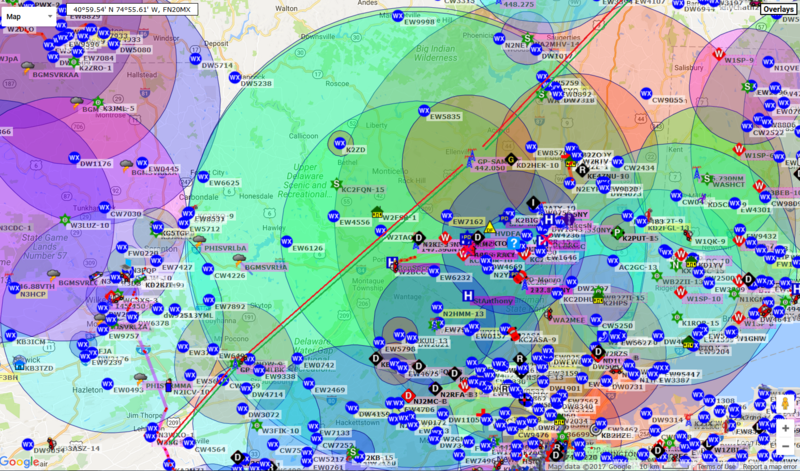 The paths have been proven every year since 2009 during our annual Appalachain Golden Packet Event where dozens of us climb the mountains and set up temporary APRS digipeaters to relay the golden packets the entire 2000 miles. Starting in 2016, we shifted from 1200 to 9600 baud to better characterize the paths for a permanent backbone. 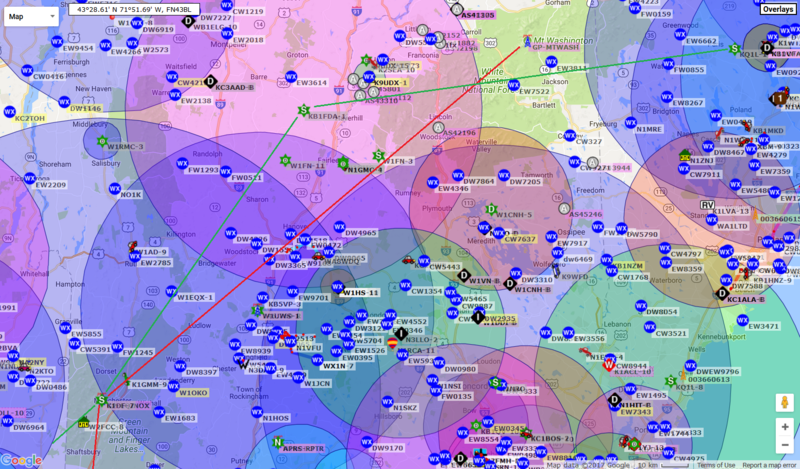 All stations reported success from Maine to Georgia with only a marginal link in Virginia from AO mountain. This has given us excitement about this potential network. It seems the path is viable for this long haul backup emergency communications network while serving hikers on a routine basis. 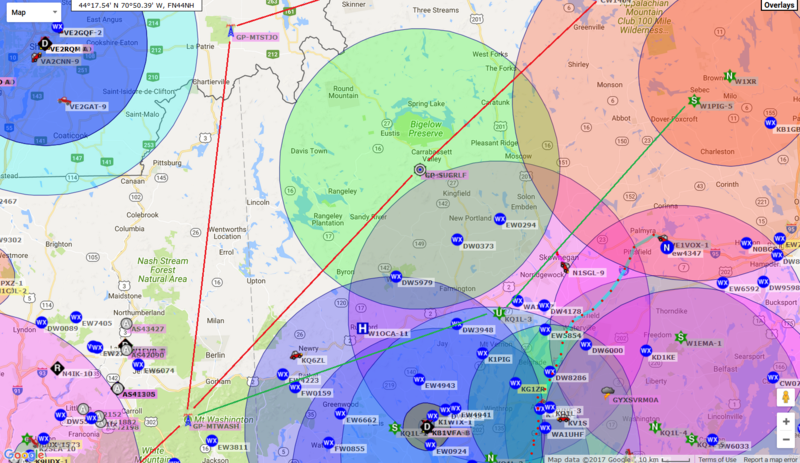 Network Map: The map at right shows red circles on the sites where Hams already have permanent access and could possibly install a permanent node in this East Coast 9600 baud backbone. Are there others? (See below)! 219 MHz Considerations? 220 could be an ideal band for the backbone since it could fit in easier at some sites, but the hiker's APRS radios don't do 220. And starting with the backbone is getting the cart before the horse, since we'd have to have a second radio for the hiker access. 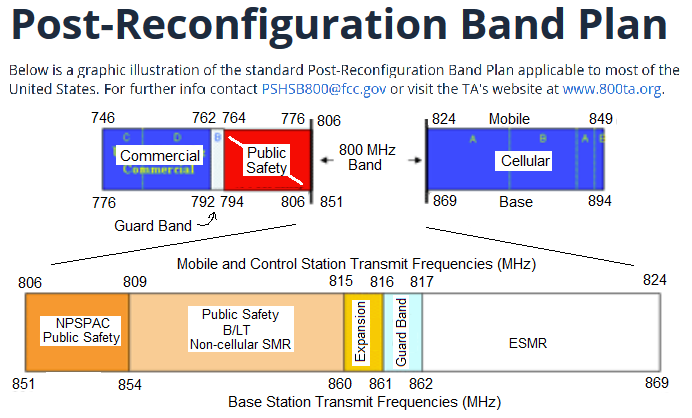 We looked at the special 219 MHz band where the FCC has very stringent rules under part 97.303(e) to get a frequency. 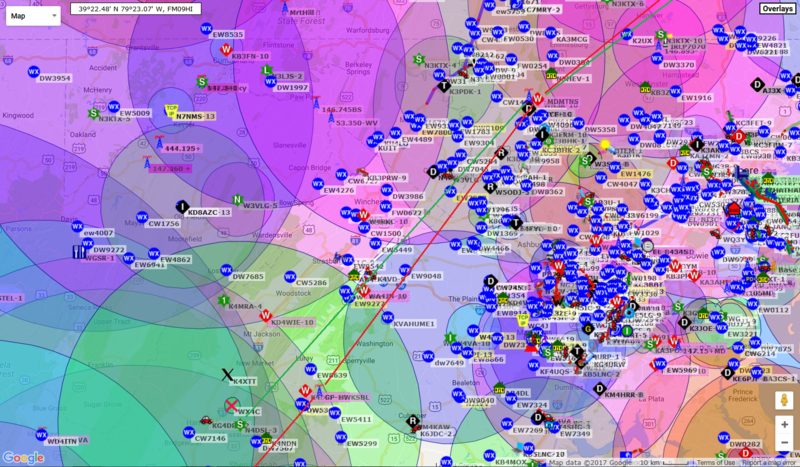 These frequencies are shared with the Maritime AMTS system (see also). 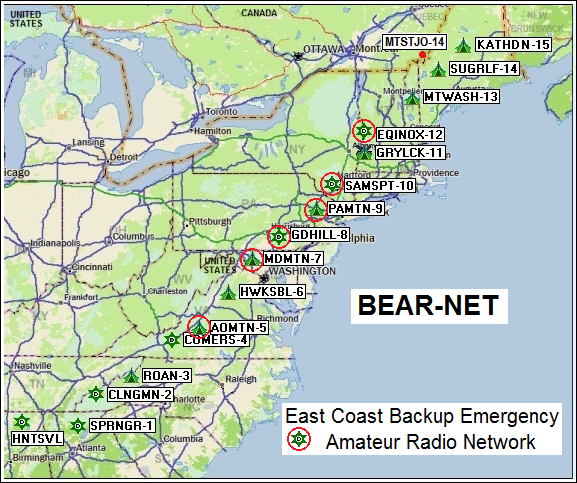 The ARRL maintains a list of these 219 MHz AMTS stations and these are the ones near the AT. 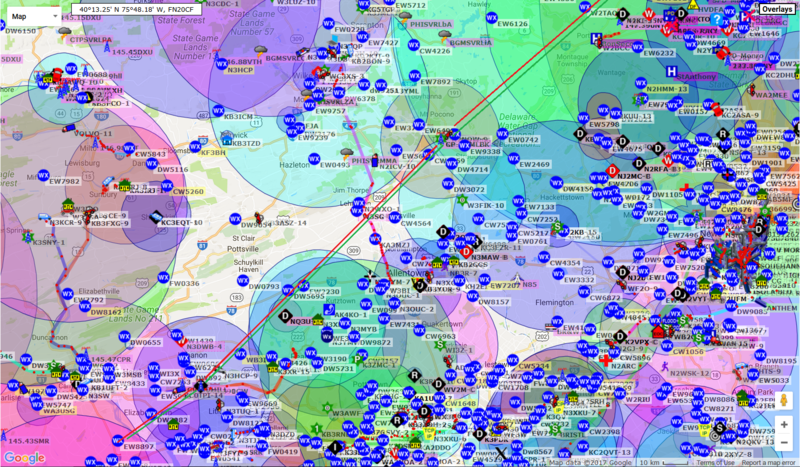 But there has been so little 219 MHz activity, and no one seems to know the status of those frequencies. The company that bought most of the spectrum in 2007 seems to have gone bankrupt in 2011?. 223 MHz channel: There are 7 digital 20 kHz channels in the 223.52 to 223.64 MHz range (ARRL band plan), but again, makes no sense to start with a band the hikers cannot use. 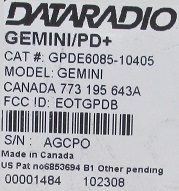 We were considering this 30 Watt 220 MHz radio. 433 MHz might be good! So, why not use 433 MHz as the new hiker access channel and for the time being, it can also be the network backbone. 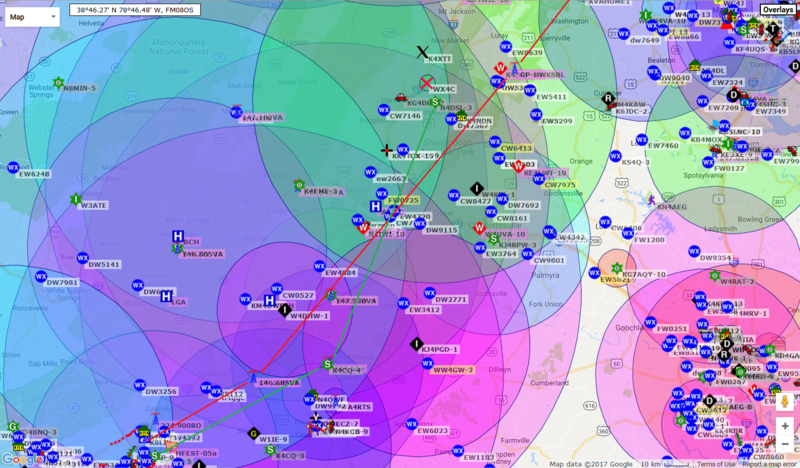 We just add one radio and a TNC and the network is done. Later, if we want, we can add a dedicated 220 backbone. By using a 433 MHz simplex channel, we are far enough from 445 repeaters so that minimal filters are needed and maybe we can simply find a path the entire way using only existing Ham sites? 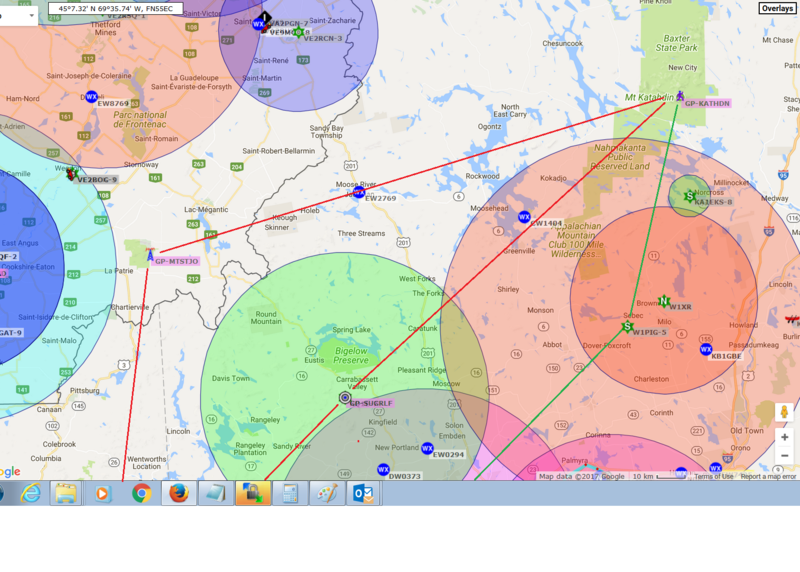 Here is a set of APRS.FI plots of all the potential existing digipeaters. If we could get those hams to add a 433 MHz TNC we might make this work! Or Maybe initially on 2 meters: Cavity diplexers at repeater sites have excellent isolation between their TX and RX frequencies but the cavities also have much broader highpass and lowpass attenuation beyond the repeater frequencies. For example it takes two large cavities on 144.39 to allow operation at any 145 MHz repeater site because the repeater input cavities are quite open below their tuned frequency. So any colocation of APRS at any voice site usually requires heavy filtering so as to not desense the repeater. For a single ATGP channel, the best possibility might be in the 145.01 area which is quite far from repeater inputs. 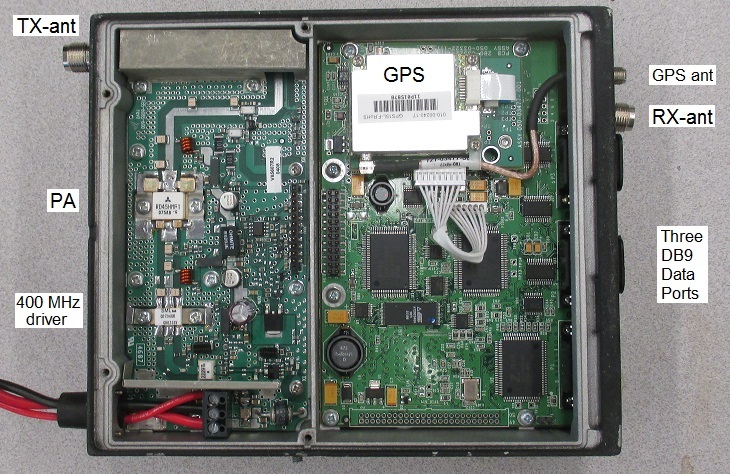 This solves the repeater desense problem but puts th eonus on us then to have a cavity to protect our front end. See the 2m bandplan and cavity considerations below right. The original national packet channel of 145.01 seems to be the best starting point. Smokies to Comers Rock - W4MLN? Sams point NY to MasachusettsGreylock - permanent? Legacy VHF Nodes: We also looked at using one of the VHF data channels and searched to find what remains of the original packet networks in the 1990's. 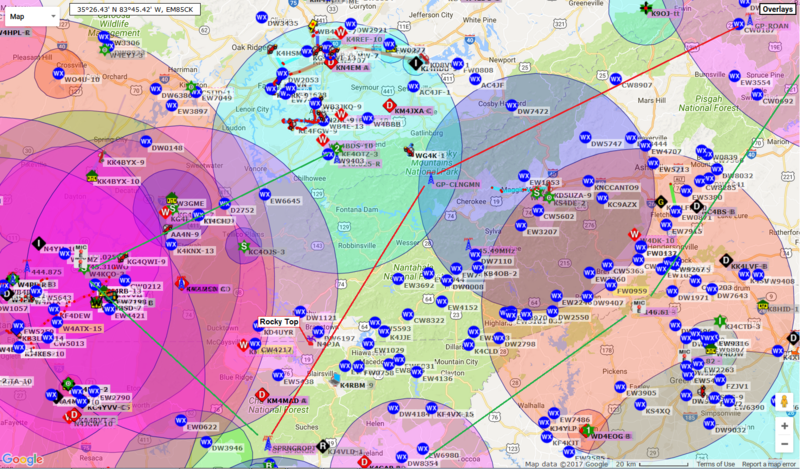 We found the VDEN network in Virginia and the SEDAN network in North Carolina. There was also an Eastern PA network but it appears to be last edited 10 years ago. Then there is the Connecticut Packet Facilities and there is a New England Digital Network but it is for digital voice. but sure has a lot of sites... And lastly, there is the Maine packet network. But adding yet another VHF channel to existing sites which might not only have VHF voice repeaters but also APRS on 144.39 makes this hard. Clingmans Dome-2 . . . . . 2013 . . 89 miles to . . . Roan Mountain. Roan Mountain-3 . . . . . . 2013 . . 72 miles to . . . Comers Rock. Mount Equinox link-12. . 2013 . . 100 miles to . . Mt Washington. Mount Washington-13 . . 2013 . . 102? miles to . Sugarloaf. Sugarloaf-14 . . . . . . . . . . 2013 . . 61? miles to . . Mount Katahdin-15. Mount Katahdin-15 . . . . 2013 . . DONE!!!!! 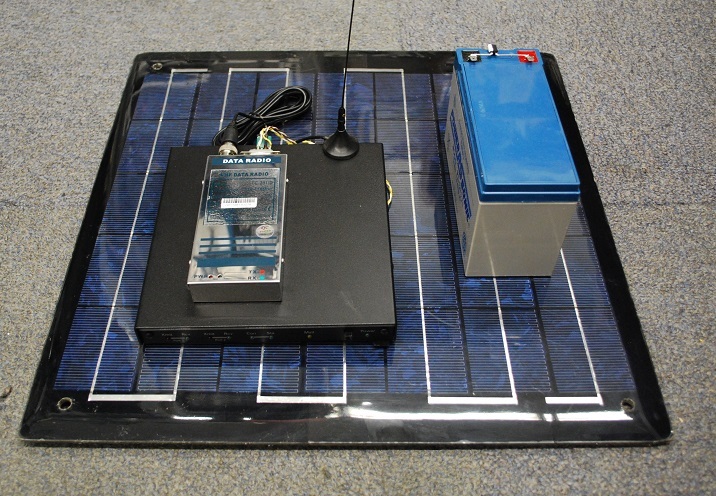 Permanent Node Hardware: The image at right suggests a possible design for a 5 watt node using a 5W UHF digital radio, a KPC-9612 TNC, a 7 AHr battery and 20 watt solar panel. Packaging for permanent installation in an unattended remote site is the biggest chaallenge to this network. The nodes would be configured for both HOPn-N digipeating like we have done for the last 9 years during the Golden Packet event and also for level 4 KA node networking (compatible with NETROM legacy). This lets it serve the hikers (digipeating) and emergency backbone traffic too. END USER FREQUENCY: Bryan and Bill pointed out that end users should not be on the same frequency as the backbone and so that suggests user ports should be on VHF or UHF to work with their existing 9600 baud packet radios. But on the other hand, the KPC-9612 is dual port, with one port operating at 9600 baud and the other at 1200 baud. So naturally, the backbone has to be 9600 baud to handle the bulk of the traffic and so the end user is at 1200 baud on the local frequency. But then we realised as a first step, just put a single 433 MHz radio operating at 9600 baud. 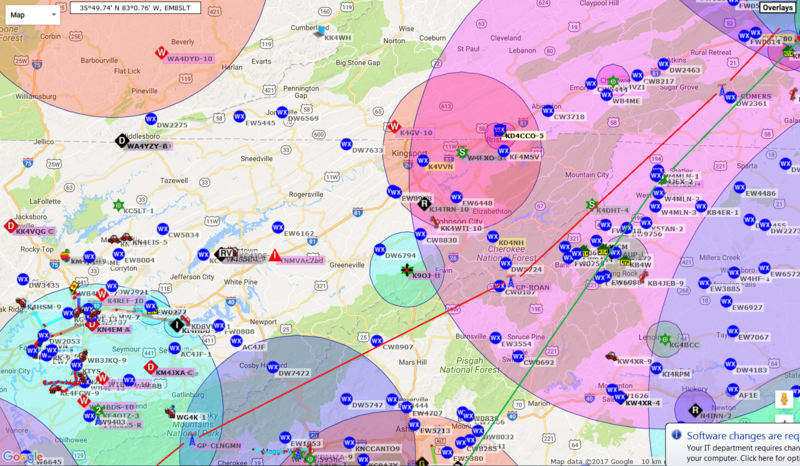 Users APRS radios can hit it directly for digipeating up and down the Appalachian trail and we can also do some level-4 networking too. NODE BATTERY POWER: Presumably, many of these sites will need solar power, so here is a rough estimate of battery capacity. For example, a VHF 5 watt radio and Kantronics KPC-9612 TNC each draw about 40 mA but peaks at 1 Amp during transmit. If we assume a 24 hour dutycycle of about 2%, then the TX average current is another 20 mA for a total of about 100 mA average current drain. A rule of thumb for the east coast is that you get about 4 hours average solar power and that needs to power the system for the full 24 hours. So the solar capacity has to be SIX times the average current to break even on sunny days. Multiply this by at least 3 times to make up for cloudy days and we end up needing about 2 Amps solar charging (24 Watt panel) and about 7 to 9 Ahrs of battery capacity as shown above right. 900 MHz Possibility? Here is a batch of radios I picked up at Dayton 2016. They are clean and support 14.4 kPBs on three serial ports and have separate antennas for TX and RX. But the bad news is that they are 800 MHz and of course we have no access to their firmware and coding. The guy who sold them to me said they were "UHF" so I guesss he was technically correct. Anyway, there are 25 of them and if we can figure out a way to get them to 900 MHz or use them at 420 MHz, then these might also make a nice backbone. Operating at UHF 433 MHz? Looking at the 800 MHz band plan, these radios appear to be transmitting in the 824 MHz ESMR band and reeciving in the 860 MHz range. A possible way to use some of this hardware is to simply bypass the 45W PA doubler final transistor (824 MHz) and use the output in the lower end of the 420-450 MHz amateur band from the 15 Watt Driver transistor which already works at 412 MHz or so. 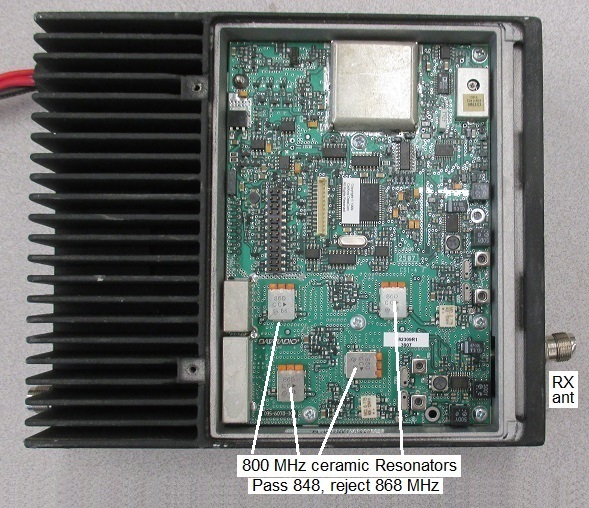 Then scrap the 850 MHz receiver and stick in our own receiver for 433 MHz? UHF Exciter Transceiver: The very rugged die-cast box has plenty of room for a UHF transceiver of our choice. The D2294UK 15W driver transistor (datasheet) needs about 1 Watt for full power, so all we need to find is a small 1W XCVR? OOPS... and then add a T/R circuit. Maybe we can do that with 1/4 wave lines and diodes? 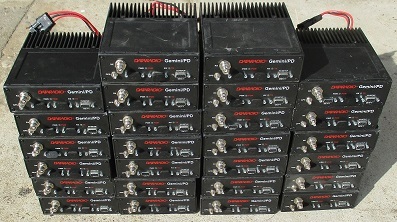 Or does that just generate products..
Full power on UHF? And since the 45W PA transistor (datasheet) will work fine (See S parameters) down at UHF, maybe we can cut the output strip lines and add inductance and retune it for UHF and get the advantage of the full 45W power? How does one re-bias the PA to encourage it to operate as an AMP and not as a doubler? Higher or lower bias?